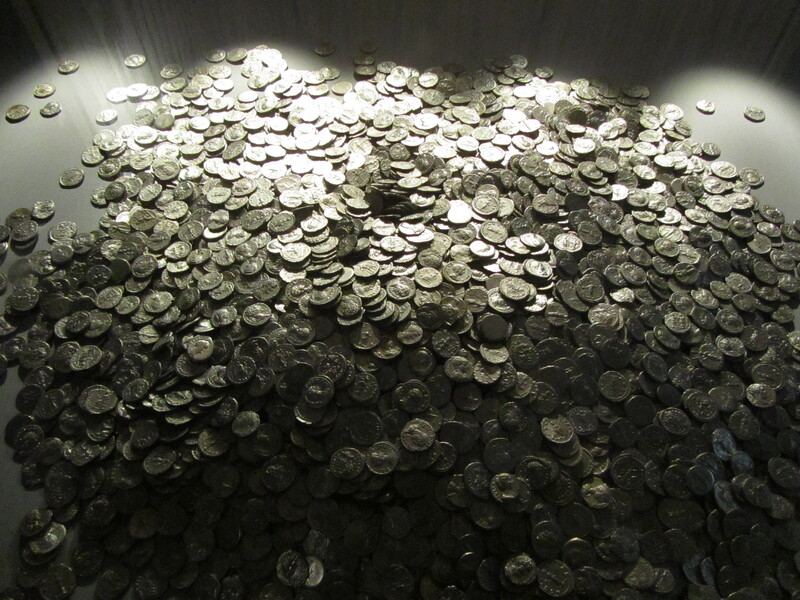 Take a look at this rather attractive pile of coins; who doesn’t like a bit of treasure? It’s actually a photo of the Shapwick Hoard, a collection of 9,262 Roman silver denarii coins found at Shapwick on the Somerset Levels in 1998. The hoard was discovered by amateur metal detectorists in a field at Shapwick. They excavated it before reporting it to the Portable Antiquities Scheme. During later archaeological investigations it was shown to have been buried in the corner of a room of a previously unknown Roman courtyard villa. Around 9000 coins lay in situ, with other distributed across the field by modern ploughing. When excavated, the coins were shown to be arranged in neat individual rows on their sides, suggesting that they may have been deposited in small coins rolls or individually wrapped bundles using textiles or materials which had since decayed Due to the roughly circular shape of the hoard it’s thought that the rolls of coins were in a larger sack. The coins range in date from 31 BC up to 224 AD and come from the mint of Rome. Over half of them were struck in the reign of Septimius Severus (193–211 AD), 260 were from the reign of Mark Antony (31–30 BC) and two rare coins never before found in Britain were in the hoard. 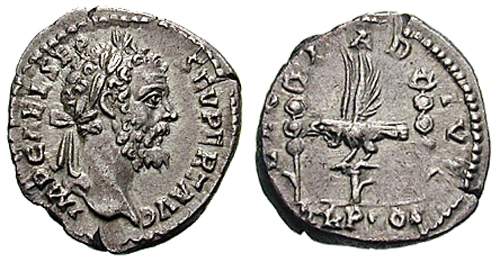 These depicted Manlia Scantilla, the wife of Didius Julianus, an emperor who was murdered only four weeks after the coins were struck. It’s estimated that the hoard as a whole represented ten years pay for a Roman legionary. There are many theories about why people would bury hoards and then not return to retrieve them. Many are thought to have been deposited because the owners wished to keep something safe before returning to them, either because of local unrest or because they were travelling and couldn’t carry them. Hoards like these are generally made up entirely of functional or broken items. Other hoards are thought to have been deposited because they represented loot or spoils from raiding, the buried treasure of the movies. Then we get the hoards which seem to be votive, that is, hoards which have been deliberately buried, probably for ritual reasons, with no intention of the owner of retrieving them. Often the artefacts buried in these hoards are ritually broken as a sacrifice to the gods. The discovery of a Roman villa at Shapwick and its Severan coin hoard of 9238 silver denarii, R. Abdy, R. A. Brunning and C. J. Webster, Journal of Roman Archaeology, Volume 14, 2001. Click here.